It is festival time in Madurai -Goddess Meenakshi Thirukalyanam and Alagar aartil irangum vaibhavam!The devotees in hundreds are awaiting andworshipping Alagar on his way to Madurai to attend the wedding of Meenakshi. Well the story goes that the celestial wedding gets over, before Alagar reaches Madurai. So Alagar changes his plan to cross river Vaigai to attend the function. Instead he just gets in the Vaigai and enthralls the thousands of devotees with his dharshan and returns back to Algar Koil, along the banks of the river. Before reaching, he gives dharshans in various attires in different mandapams. In the Ramaraya Mandapam, Dasavadaram is enacted! People in their new dresses and some devotees dressed up in their special shorts and long zari, decorative caps, carrying leather bags containing water - all eager to see the God - is really a sight to be seen. Alagar rides the golden horse and steps into the river; this is when the devotees pump out water from the leather bags on to the thronging Bhakthas. These devotees are so enthu. ;they travel with Alagar back to Alagar Koil. 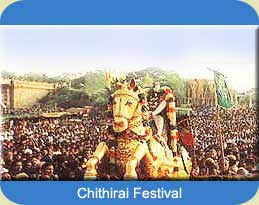 This Chithirai thiruvizha was started by Thirumalai Nayak to unite the saivaites and vaishnavites. Hundreds of people from villages around Madurai come to celebrate the festival. Exhibition - the chithirai porutkatchi - is a regular feature every year! hi, It would be great help if some one could help me with the weblink for a video of the entire thirukalyanam as I couldnt catch it on tv.